Craig Fagan, Head of Global Policy for Transparency International, assesses the Sustainable Development Goals, particularly SDG16 (Peace, Justice and Strong Institutions), the need to end corruption, and what we need to do next in order to accomplish the Global Goal. Governance matters- and we all know it. Evidence abounds about what happens when institutions fail and corruption takes root. No country is immune. Not even the UK. Corruption probes into police misconduct dot the headlines. According to the most recent figures, 1 in 3 Brits think the UK political parties are corrupt. The same number say corruption is getting worse in the country. This is why the new global goal on governance is a game changer. Like all of the Sustainable Development Goals – an unlike their predecessors the MDGS – Goal 16 must be met by all countries. All countries must promote peaceful, inclusive societies. They must ensure access to justice. All countries must have institutions that are effective, accountable and inclusive. They must end corruption. No longer can corruption and governance be thought of issues that are other peoples’ problems. Tackling the goals starts at home. Transparency International has argued since it was founded that development and governance go hand-in-hand. The development data is startling where corruption flourishes and governance is absent. We know that widespread bribery is associated with higher maternal mortality and more children dying before they even reach the age of five. 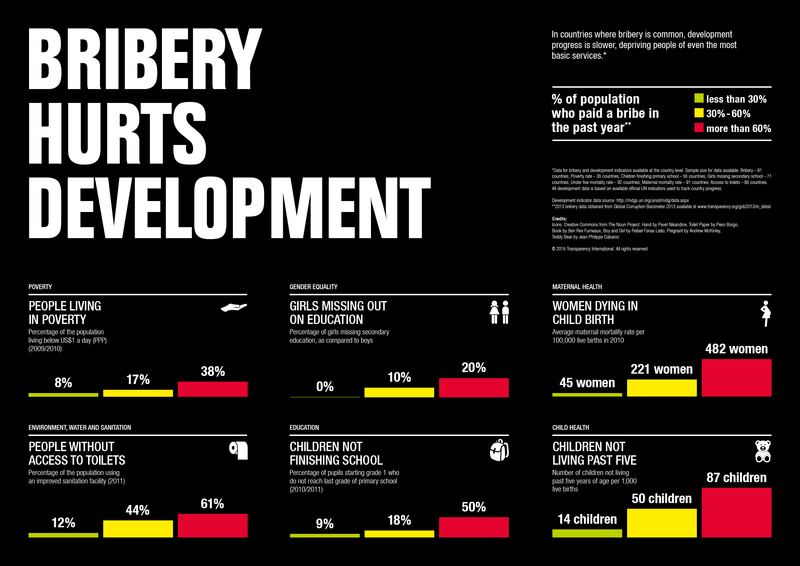 Countries with rampant bribery have five times the number of children not finishing primary school, as compared to countries where corruption is low. In the poorest countries, one out of every two people has to pay a bribe to access basic services like education, health and water. For too long, policies targeting governance and development have been designed as if a firewall separates them. Worrying about how corruption was affecting schools was too often delinked from policies to scale up education. Health care policies did not look at how corruption could be impacting the delivery of medicine and services. The same can be said of a range of issues, from agriculture to water. Finally the SDG agenda has helped to close this gap. Goal 16 is the anchor for this to happen. Its inclusion also signals that many of these issues need to be addressed by all of the goals. Now is the time to convert the promises on Goal 16 and all the SDGs into action. All countries have 15 years to deliver on their commitments by 2030. Not a moment should be wasted. All governments – from Australia to Zimbabwe – should set out 180-day plans for how they are going to roll-out the goals and targets at the national and local level in their countries. Colombia has already moved this along. Others need to follow its lead. The UN must make monitoring bribery a priority at the global level as part of tracking country progress on the global goals. Corruption and governance can and has been measured. The UK and other members of the group tasked to select indicators need to be reminded. Data from different sources, like NGOs, companies and others, is essential to track all the targets. Data must be open and deliver on the data revolution. Governments must create a monitoring framework that builds on existing processes and is evidence-based, feeding local results up globally. For example, other review processes – whether on open governance, human rights or anti-corruption – are happening. These need to be aligned together and tapped into. The hard numbers should be aligned to international reporting standards so they can be quickly gathered and compared. IATI, an open data standard, offers a good solution. In the case of the UK, the timing is right for Goal 16 – if not all of the SDGs. The new and future action plans on open government could help to link goal 16 targets to concrete actions and indicators nationally. The planned global anti-corruption summit could serve as a catalyst for getting governments from around the world to start acting on goal 16. It’s a big agenda to deliver on but one that the UK and all countries must do. Now is as good a moment to get going on it.